This high performance PVC textile is engineered for commercial and residential awnings and canopies. It is suitable for sewing, welding, digital printing and fabrication by various means common in the awning fabrication industry. In addition to its durability, Coastline Plus Awning Fabric is a PVC fabric that carries a manufacturer’s warranty against UV degradation or fading. It is mildew, stain and dirt-resistant. 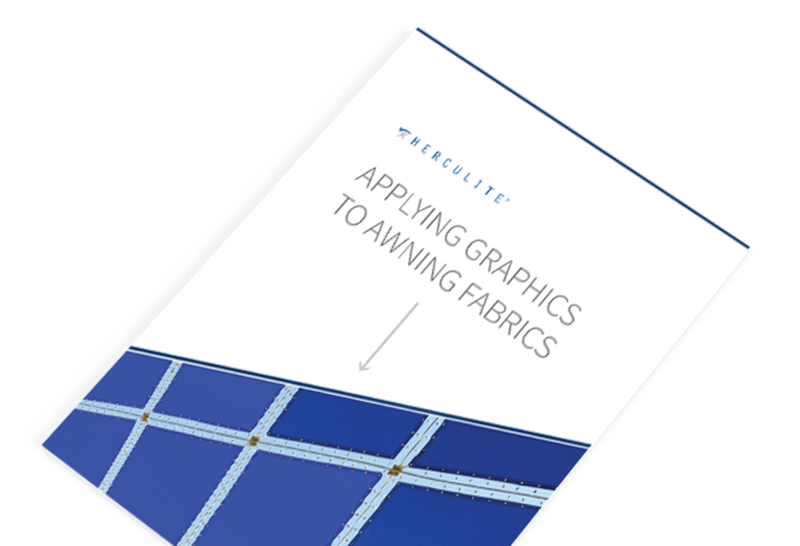 The textile features a proprietary top coating that supports most types of graphics including pressure-sensitive vinyl lettering for sign decoration. Awnings and canopies fabricated with Coastline Plus offer their owner confidence that their awning canopy will stay water-proof, tight on the frame and stay inherently fire resistant. With a properly engineered frame support structure, Coastline Plus is suitable for year round snow load and wind load requirements. The patented Rain Kleen® finish provides a self-cleaning feature to reduce care and maintenance responsibility. Awnings made with Coastline Plus Awning Fabric will provide years of useful weather and sun protection. 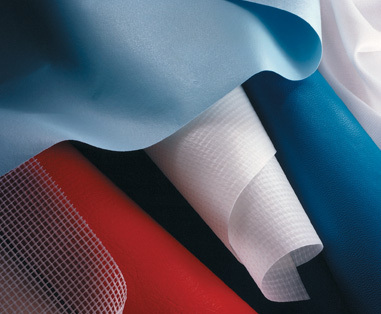 Coastline Plus is made in America and is the ideal PVC composite fabric for awnings and canopies, poolside structures, car shelters, patio covers, walkway coverings, privacy screens, curtains and in-home decorative ceilings, awnings and drapes. The Coastline Plus brand fabrics are presented in three designer categories: solids, stripes, linen back and the spectrum collection. 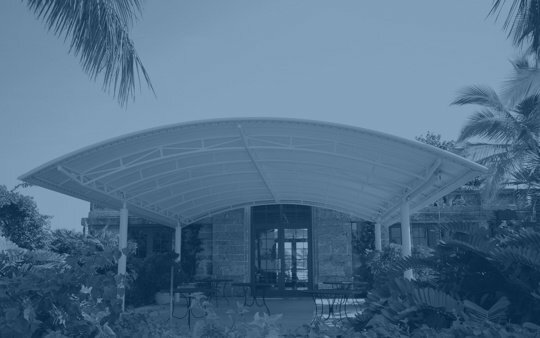 With new breakthroughs in construction and materials, Coastline Plus awning fabrics exceed owner expectations by providing countless years of protection from the elements. With plenty of beautiful styles to choose from, Coastline Plus awning fabrics provide a stylish, polished look for any home or business. Constructed from top-of-the-line materials, Coastline Plus is the leading choice when it comes to awning fabrics. Age, fade, dirt and mildew resistant. Dozens of styles in solids, mono and multicolor stripes. Accepts most types of applied pressure sensitive graphics. Coastline Plus® is a no-fuss, no-muss type of awning fabric you’re sure to enjoy for years to come. Coastline Plus will not shrink, sag, stretch or start to pocket, unlike other acrylic awning fabrics. Owners never have to worry about their awning fabric since it is made from vinyl and polyester composite materials, designed to withstand the elements. In addition to its durability, Coastline Plus awning fabric is a PVC fabric that will not fade or age; plus it is mildew, stain and dirt-resistant. The fabric is also top coated and supports most types of pressure-sensitive graphics for when businesses want to advertise their logo. Cleaning your awning is a breeze! If Coastline Plus ever gets dirty, all you need to do is hose the awning down. Any excess dirt is brushed off with a soft-bristled brush, and then hosed off with water. 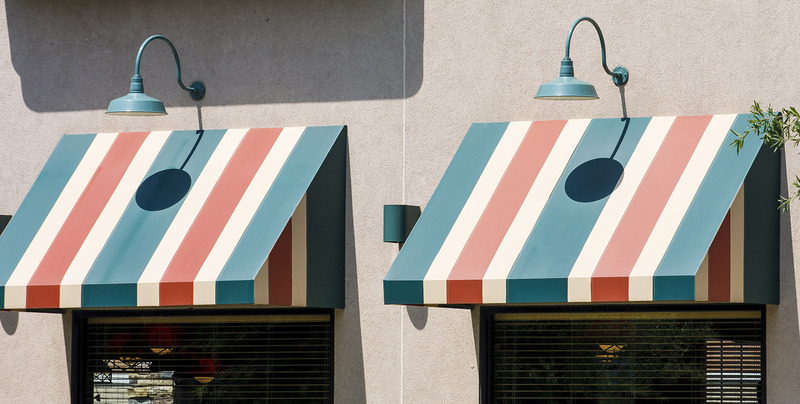 Rain Kleen® helps keep the awning looking brand new for years to come. Description Vinyl laminated on a weft insertion scrim base of high tenacity filament polyester. Coastline Plus® Awning Fabric is a polyester reinforced PVC fabric that will provide many years of satisfactory service. It is waterproof, flame, mildew, stain and dirt resistant. 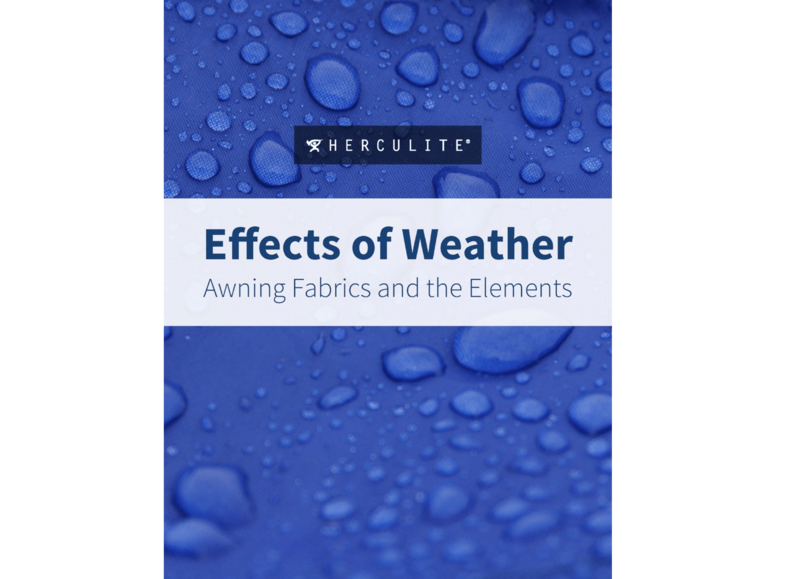 Herculite’s Rain Kleen® surface treatments further enhance longevity and ease of maintenance. 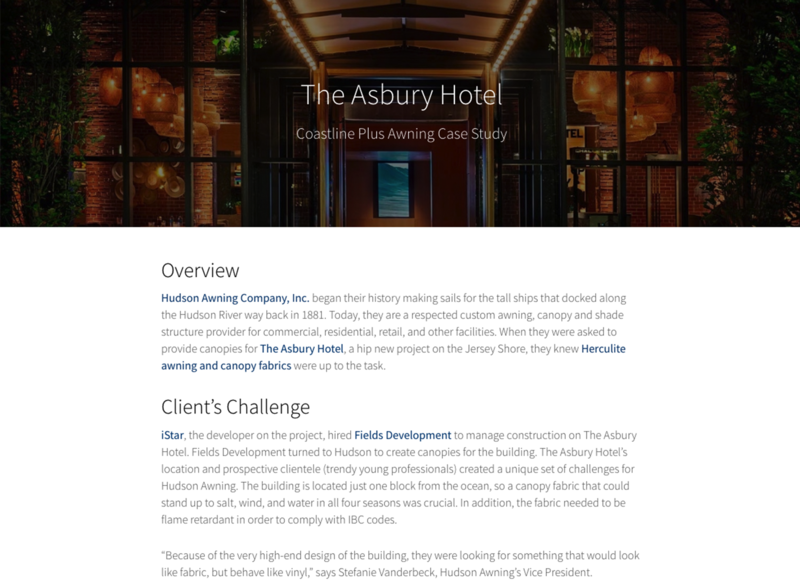 Coastline Plus® is dimensionally stable. Properly fastened to the frame, it will retain its trim fit as well as its protective function and aesthetic value. Since no material is impervious to all hazards, proper maintenance is important if maximum life of the product is to be realized. underside. Mildew can grow on dirt, but does not grow on or attack the Coastline Plus™ vinyl. normal conditions. It does not cover damage to the fabric from acts of God, vandalism, neglect or improper use including the misuse of solvent based cleaners that can damage the top coat. Is Coastline Plus awning fabric waterproof? Yes. Coastline Plus® awning fabric is vinyl completely waterproof. 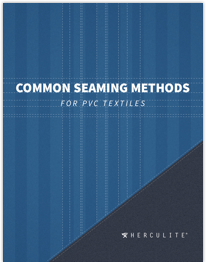 The fabric can be dielectrically, hot air, or wedge welded to ensure that seams are 100% waterproof as well. Will Coastline Plus® awning fabrics develop mildew? No. The Coastline Plus® formulation contains mildew inhibiters that will not support mildew growth. Mildew that does appear will grow on any dirt or residue that is left on the surface of the fabric. How do I clean Coastline Plus® awning fabric and how often? Occasional hosing with clear water will prevent dirt accumulation. Most dirt accumulation can be removed by mild soap, water and a soft brush. Rinse thoroughly. In extreme cases, most dirt can be removed by applying half strength bleach and brushing softly to cover thoroughly the necessary area. Allow solution to remain for two or three minutes, then thoroughly rinse with clear water, protecting surrounding materials or plant growth that might be damaged by the bleach. Do not use solvent based cleaners. 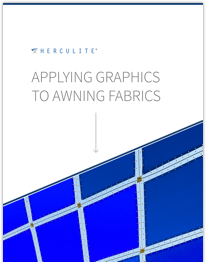 Will Coastline Plus® awning fabrics accept Pressure Sensitive Vinyl Graphics? Yes. Coastline Plus® is Top Coated with a specially formulated and proprietary acrylic lacquer treatment called Rain Kleen® that acts as a barrier between the fabric and the vinyl graphic. This prevents plasticizer migration which is the leading cause of Pressure Sensitive Graphic failure. Other decoration methods include: solvent based digital printing, heat transfer films, heat sealed and inset vinyls, applique, silk screening and hand painting. 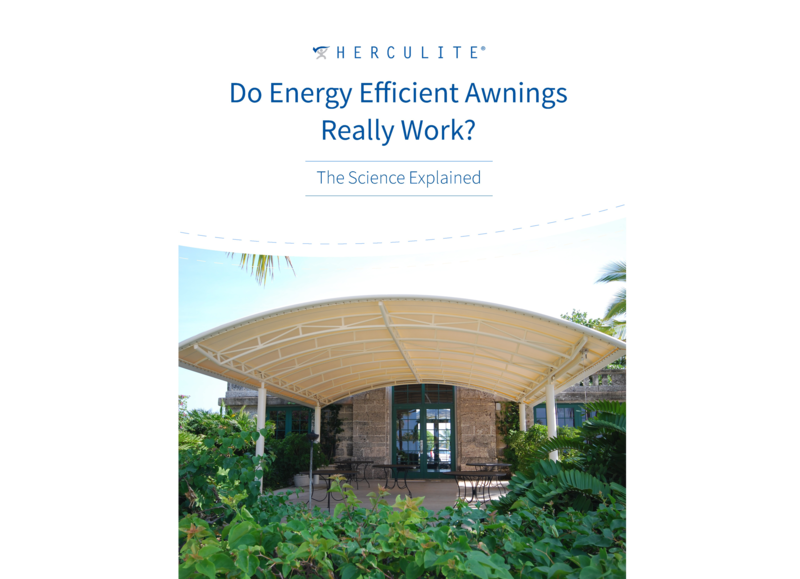 Will Coastline Plus® awning fabrics provide UV protection? Yes. Coastline Plus® awning fabrics have been tested and proved to provide 99.9% UV protection from the sun’s harmful rays in most colors. The fabric offers a SPF rating of 50+. Is the Coastline Plus® 5-year warranty pro-rated? No. 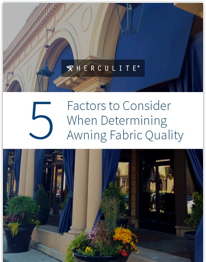 Unlike most competitive awning fabrics, the manufacturer’s warranty is “full” replacement during the entire five (5) year warranty period. 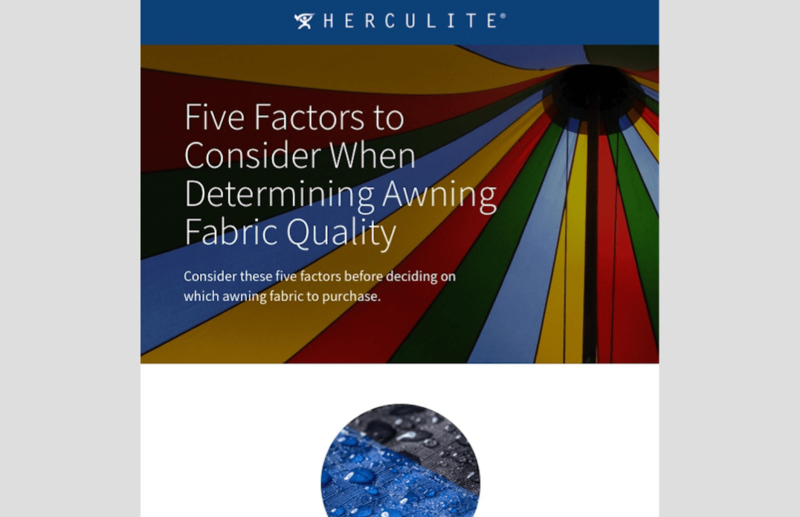 How many colors and patterns does Coastline Plus® awning fabrics offer? Coastline Plus® awning fabrics are available in over 50 patterns. 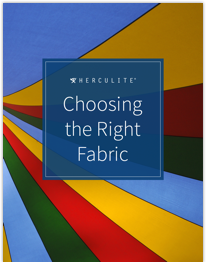 This is the largest color selection of vinyl awning fabrics in its class!